Hope you all had a fabulous Christmas...we did! Please display our showCASe banner, which you can grab from our page at the top. Well done ladies, your cards are simply sensational! 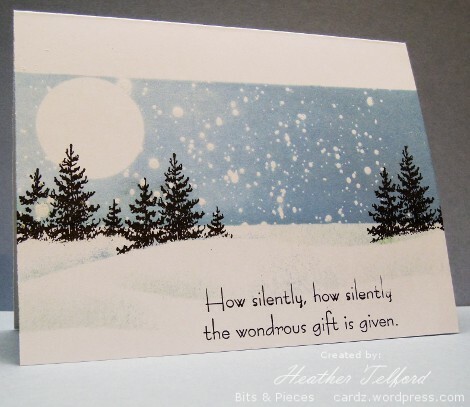 Whatever type of clean and simple card you make, the sentiment must consist of simply one word. I guess our card to you would merely say "Thanks ". There are lots of sentiments where a single word can say it all... Enjoy, Welcome, Peace, Joy, Birthday, Sympathy, Love, Thanks etc.. 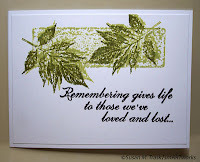 It may be necessary to select just one word from a sentiment stamp in your stash. 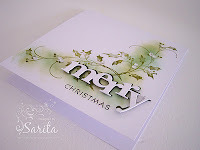 A good way to do this is to mask the unwanted words with sticky tape before the stamp is inked, which is then removed before stamping onto your project. If you ink the whole stamp, even if some words then have the ink removed, there's always the chance of getting a 'ghost' impression when you stamp with it. 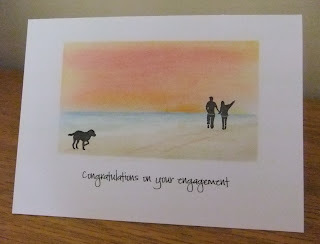 You have most probably seen something similar to this from me before, but this time I wanted to try all neutral colours and so began with Crumb Cake cardstock as a base and sponged and inked a panel after masking the card with Post it notes. I used Crumb Cake, Early Espresso, Sahara Sand and Soft Suede, plus the white of course. The sentiment is part of a stamp from the now retired SU Occasional Greetings set, which I masked with Selotape before inking so as to use Just One Word! Here is a fab Penny Black stamp of these amazing ducks wishing everyone a wonderful Christmas. They're coloured with Copics and the letters are gently glittered with Glamour Dust. For my card I used a FAB set from Close to my Heart, Over the Rainbow. I love the quirkiness of it! 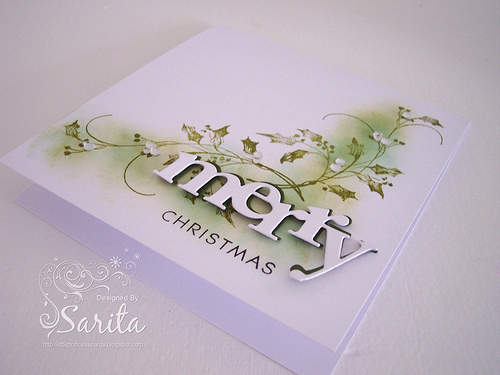 The colours used are Stampin Up, Bashful Blue, Pear Pizazz and Regal Rose. I stamped the segments, then positioned them by using 3d foam. Once I had figured out where I wanted to rainbow to go, I then stamped the 'Somewhere'. When I was planning it, I did picture it going off the page, but as you can see that didn't happen! To finish I used glossy accents on the rainbow. 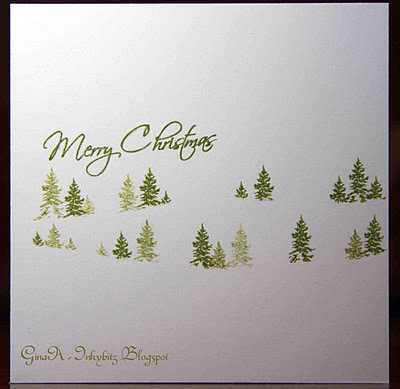 My second card is, as Chrissie has done a variation on a previous design. I tend to do this, if it works, it works, so I alter slightly knowing it will be a lot less faffing for it to look right! The letters are Sizzix Fun Serif Upper and Lowercase, sadly discontinued now, but, there are some sets around on ebay. the stamps are Hero Arts, coloured with Promarkers and then glittered with Glamour Dust, as are the letters. 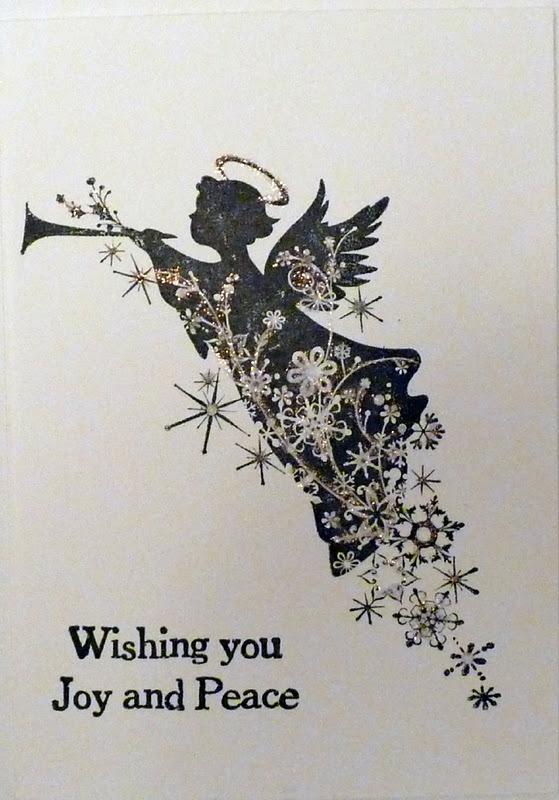 We do hope you will finish the year being as creative as you have each and every week! We will visit you all, but maybe not everyday. It seems like we've both been manically busy over the past few weeks, Mandi producing stationery in epic quantities and Chrissie involved with many singing engagements and also the odd requests for sewing. The long and short of the matter is that we have failed to post some Showcases and we also have to announce our November winner. Without further ado and in no particular order, here are our ShowCASe choices. With such fabulous submissions each week, choosing our showcase cards is always a difficult yet pleasurable task. For our monthly winners we like to choose crafters who have shown loyalty to our challenges, by their submissions, commenting and general participation in "Less is More". who almost without fail manages to get a fab submission for each challenge posted within the first hour of the post going live. We will pass on your email details to Amber Ink so that they can forward your prize to you. Please grab the winner's Badge above. Congratulations everyone and once more, apologies for the tardiness of these postings! Do please take the ShowCASe badge from the page at the top of the blog which we hope you will display with pride. So, is everyone ready for Christmas? or all in Mandi's case! Thank you for all the snowy cards last week, luckily we have escaped the real white stuff so far down in our neck of the woods. We get together and decided on the challenges for each week, some are obivoulsy more Chrissie, or more Mandi... it's no surprise that this week is more Chrissie! We do hope you enjoy it and please be as creative as possible. If you don't have any musical stamps, maybe you would like to theme your card to a song. One little tip: Chrissie can spot upside down music at 100 yards..so be careful! Another little note re our showCASe choices. We know we are behind, but will endeavour to rectify that over the course of the next week. As you can appreciate LIM takes up a lot of time which we have been desperately running out of lately. 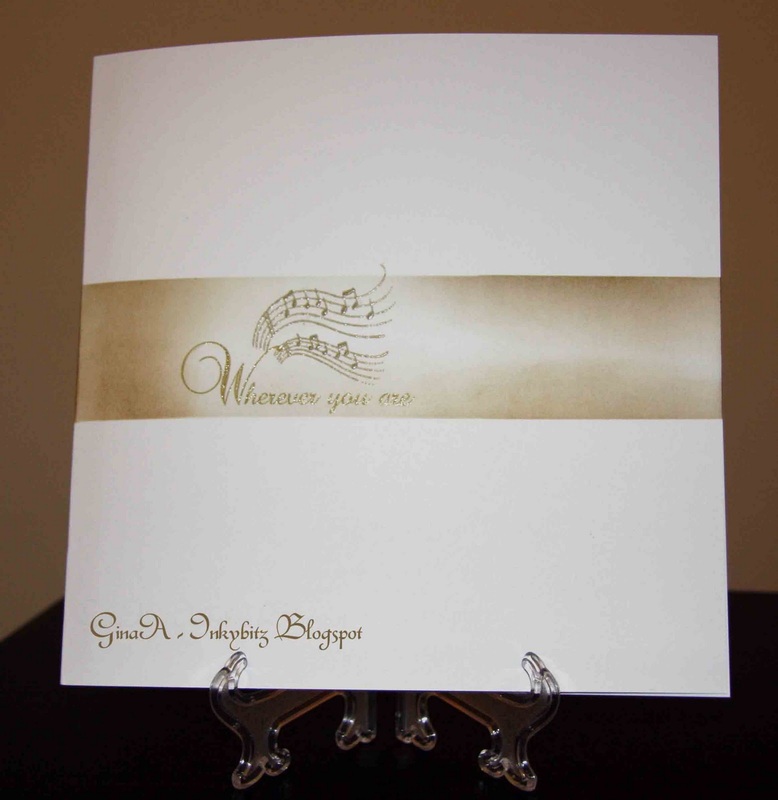 This card uses the Notes wheel from Stampin' Up and an image from Magenta of 3 instruments, which has been coloured with Copics, cut out and then embossed with clear embossing powder. The sentiment is from SU Plane and Simple. Mandi mentioned about me spotting music manuscript that has been added to cards upside down... if you're not sure about which way up it should be, a quick tip is to look at the quavers (the notes with a stick and one curly flick) The tail (or flick)should always be on the right hand side of the stick. 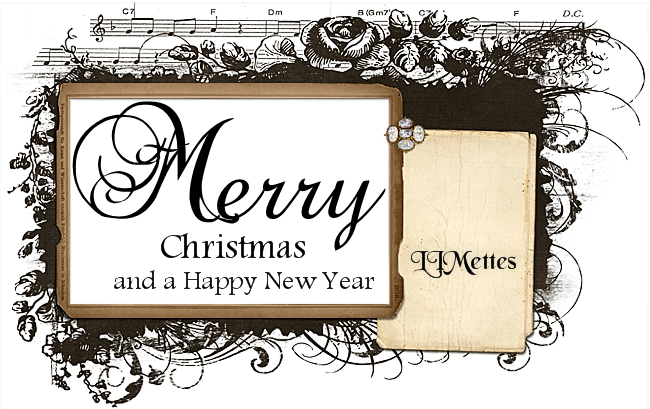 Details of how I made this one plus a few other music related cards are on my personal blog, here. The snowflakes are Martha Stewart, jewel embellishment from Hobby House and Glamour Dust to finish. I don't think it needs much interpretation, but, my 'music' is of course 'White Christmas' probably one of the most beautiful Christmas songs ever. 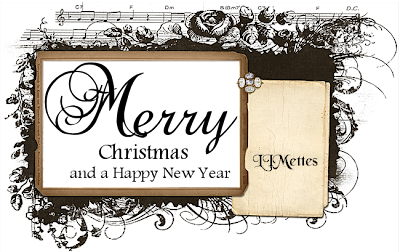 I did make another version too, when I remembered my music EF! We'd like you to interpret the theme in whatever way you wish... we don't want to preclude you from entering this challenge should you have no music related stamps... we know that just by looking at Mandi's gorgeous card, you'll be humming away in no time! So do get creative! 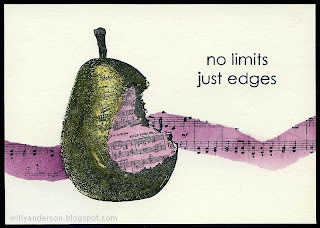 Join us, we'd love to see your musical creations! What a lot of lovely greenness we saw last week! Photographing this was a nightmare! I ended up trying the mirror as the reflection seemed to show the gold embossed snowflake better than without it! Supplies. Inkadinkdo stamps, stamped with Versafine Black Onyx, some are inked and stamped directly, then others are inked, stamped onto paper, then onto the card, for a lighter shade, adding dimension. I glittered the black snowflakes with a zig glue pen, then added the obligatory gems and a swirl of liquid pearls. Maybe you can see better in the close up photo. It really is so sparkly, but, you will have to take my word for that! Here is a card using one of my very favourite techniques... emboss resist. 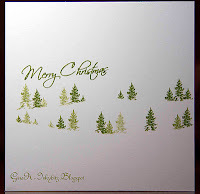 I masked the image panel using Post It notes and stamped the Artemio snowflakes in Versamark which I embossed with Wow, semi-dull clear embossing powder. 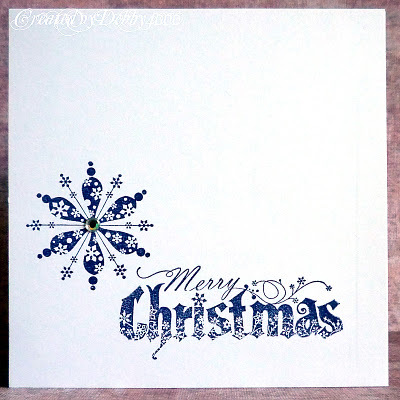 I used a stamp wheel which I think is a Rollagraph for the blobs, which I embossed with Wow Sparkling Snow embossing powder. 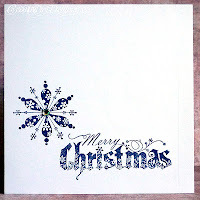 I then sponged over the embossing using Bashful Blue and Night of Navy inks applied with sponge daubers. The sentiment from Butterfly Kisses was stamped in Night of Navy with a little touch of Glamour Dust. 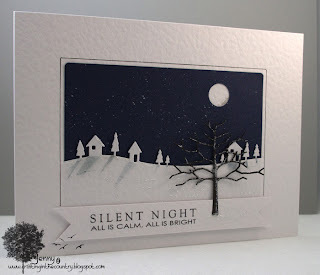 There's another card using a variation of this technique on my personal blog! For this card, I opted for a navy card base and stamped the various snowflakes in a trail using Versamark and embossed using Sparkling Snow embossing powder. The three larger ones are Inkadinkado and the smaller ones, Just Rite. The sentiment is part of a MSE stamp which I masked with Sticky tape before inking as I only wished to use part of it, I then removed the tape before stamping. We're really sorry as there were some superb entries that week. SO without further ado here are our choices. I'm sure that you'll agree that these are all absolutely stunning creations. Well done ladies and once more, sorry for the omission! Do grab our Showcase badge from the page at the top of the blog! These created the most perfect silhouettes! We are sure you will agree they are sensational! It's the shadows that did it! Thanks again, see you on Saturday for our new challenge!